That was the beginning of a 10-year collaboration, with the two crossing paths as Ed rocketed to fame—a story told here, through Goodwin’s camera. 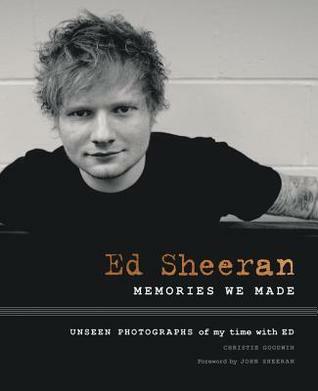 Ed Sheeran: Memories We Made shares these images and stories for the first time in a stunning collection of rare and unseen photographs charting Ed Sheeran’s rise to global superstardom. Featuring a foreword and additional photo captions by Ed’s father, John Sheeran, this is an up-close and intimate view of the singer who has captivated audiences around the world. ABOUT CHRISTIE GOODWIN: Christie Goodwin is a photographer with a career that spans over 35 years. She has worked with top recording artists, including Ed Sheeran, Katy Perry, Taylor Swift, One Direction, Paul McCartney and Rod Stewart. Christie first met Ed Sheeran in early 2008, when Ed was an unknown busker. In the ten years since then, she has photographed him many times.